Welcome to the second installment of "Watch Marc and Veronica attempt to celebrate an American or Jewish Holiday in China with limited resources". You'll recall, the first entry featured Passover and a lovely meal cooked by Marc and Veronica with the assistance and expertise of the lovely Mary D'Agostino. 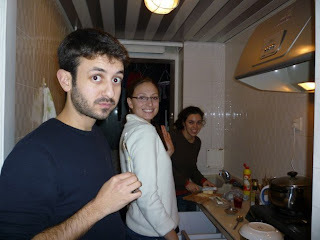 True to form, this entry features more members of the Lee-D'Agostino clan and their excellent cooking skills. Meet Jessica Lee and Roxana Wells, Veronica's sister and cousin. And know, that when I refer to excellent cooking skills, I'm really referring to Roxana and Veronica. Jess served as more of a "supervisor" and picture taker. I served as "eater", errand boy and potato masher. Though not an overwhelming meal to cook, especially with an abundance of cooking pumpkins and sweet potatoes, Thanksgiving, like Passover, provided its own set of challenges. 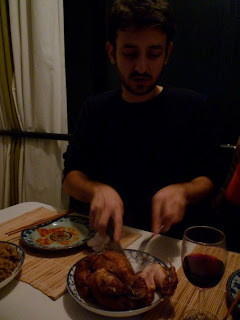 Most specifically - where do you find a turkey in Beijing?! And what is the Chinese word for cranberry? Many of you jokingly asked if we were going to have Thanksgiving Beijing Duck and we almost did! But we had just gone to a fancy roast duck place the night before and, well, we all know what too much duck in a row can do to a person. Unable to find a turkey, we opted for chicken. Nice, roasted, chicken - with head intact and legs and feet stuffed inside. This was a little shocking to Jess and Rox, but by now, I know to go for the neck first and nibble on the feet a bit. I'm not a HUGE chicken feet lover, but I am learning to enjoy them. The neck, however, is succulent and delicious. Its much easier to carve a small roast chicken than a big turkey. We didn't manage to find cranberries, but veronica improvised an EXCELLENT substitution. Common in marketplaces around this time of year, Chinese haw (山楂 in Chinese and Crataegus Pinnatifida in Science talk) is a small crabapple-like fruit that has a similar taste to cranberries. Veronica substituted haw for cranberries in her mother's recipe and came up with a great haw jelly that I actually preferred to cranberry sauce. The rest of the meal was fairly standard and delicious. A nice salad with pomegranate and walnuts, lamb meatballs with cilantro and onions, pumpkin and sweet potato soup, mashed sweet potatoes and a pumpkin pie in an IKEA tupperware! After the meal, I ate a chocolate turkey (THANKS MARY!) and we all fit onto our couch to watch Mulan - which I had never seen but all three cousins sang along to and commented about what aspects of feudal China a Disney cartoon with a talking dragon voiced by Eddie Murphy depicted properly. And then I ate another chocolate turkey.